Alpha Phi Alpha has released an “Official Statement on the Passing of Tyler Hilliard” after a authorities launched an investigation into the death of the 20-year-old University of California Riverside student who was allegedly in the process of joining Alpha and died while doing an outing with the fraternity. 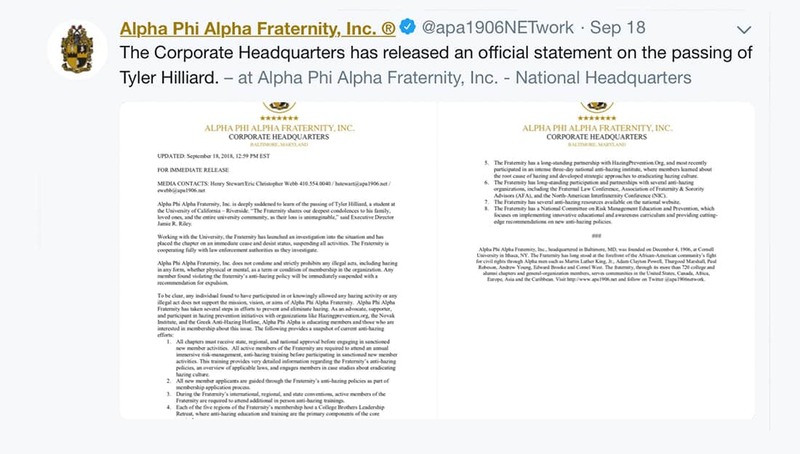 Read the full statement below that was tweeted by the fraternity from their official twitter account. Riverside Police who opened the investigation is still waiting for the results of an autopsy, according to ABC13.